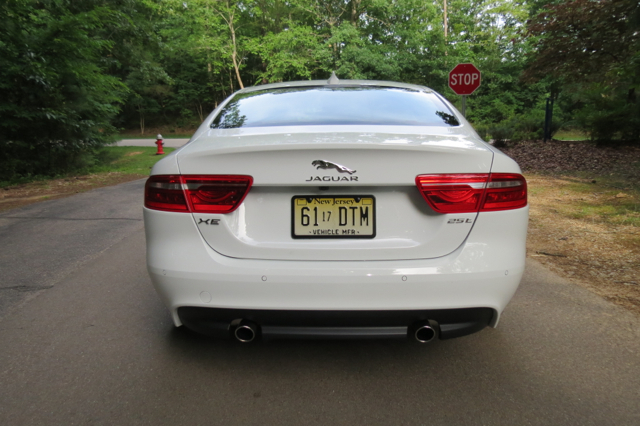 This XE is one of three Jaguar sedans. 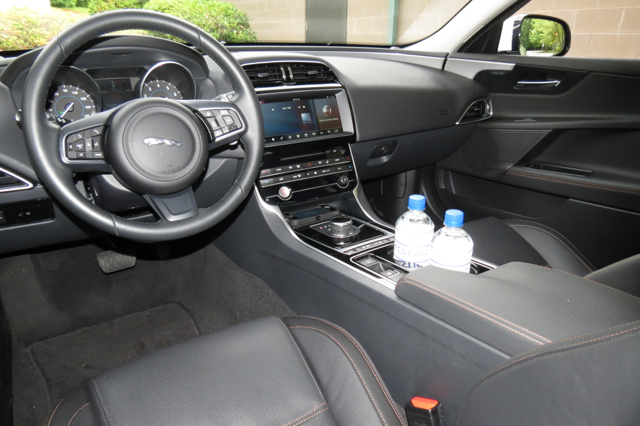 British automaker Jaguar supplied a 2017 XE for my review recently, providing me with a second opportunity to examine this all-new compact luxury sedan up close and personal. As before, I remain intrigued by this entry-level model, the smallest and least costly vehicle offered by Jaguar. The 2017 XE is available in four grades: XE (Base) ($34,900), XE Premium ($37,500), XE Prestige ($41,400), and XE R-Sport ($46,500). Rear-wheel drive is standard, all-wheel drive is available. A 2.0-liter turbo gas engine is standard; a 2.0-liter turbo diesel can also be had as can a supercharged V6. That’s a varying selection of engines for the compact range; each one comes paired with an eight-speed automatic transmission. The luxury compact segment is overflowing with choices. Besides the Jaguar XE, you’ll find the Acura TLX, Audi A4, BMW 3 Series, Cadillac ATS, Infiniti Q50, Lincoln MKZ, Lexus IS, Mercedes-Benz C-Class, and the Volvo S60. A Genesis G70 is set to arrive in 2018. As the new model on the block, the XE has its work cut out or it. That’s especially apparent as customers shift their purchase decisions away from cars to SUVs. For example, to the new Jaguar F-PACE. 1. Performance as you like it. With three engine choices available, shoppers will find that performance levels vary based on their preferred choice. Horsepower comes in at 180 (diesel), 247 (turbo gas), and 340 (supercharged V6) and that’s quite a spread. But things get very interesting when comparing torque, which is your pulling and passing power. You’ll find 318 (diesel), 269 (turbo gas), and 332 (supercharged V6). Where the diesel is slow off the mark, once the turbo spools up, the power numbers close within striking distance of the largest engine, easily surpassing the turbo gas engine. This truth underscores just how torquey diesel engines are. 2. Stellar fuel economy is within reach. You enjoy decent fuel economy with the standard gasoline engine, delivering 21 mpg in the city and 30 mpg on the highway. Oddly, those same figures also apply to the supercharged V6 — all that upfront power and you still have an efficient engine. The turbo-diesel, however, is the prize as it delivers 32/42 mpg city/highway for the rear-wheel drive model and 30/40 for all-wheel drive. So, no matter the engine choice, you’ll enjoy efficiencies, especially on the highway. 3. Technology second to none. You won’t find Apple CarPlay or Android Auto compatibility in any Jaguar product. Instead, connectivity comes by way of this automaker’s proprietary system. Jaguar’s InControl telematics system is modern, clean and efficient. The standard eight-inch screen gives way to a 10.2-inch screen in upper trims — both deliver a colorful display, limited glare, and minimal backlighting interference. The system supports Bluetooth and audio streaming, and offers USB connectivity. WiFi is optional and a host of supporting apps are available. When it comes to audio systems, you’ll find a Jaguar sound system with HD Radio and six speakers. An 11-speaker Meridian system is available. Opt for the technology package and you’ll acquire the large screen, WiFi, a CD/DVD player, and a 17-speaker Meridian audio system. 4. Exemplary safety features are present. Typically, new cars are crash tested by both the Insurance Institute for Highway Safety (IIHS) and the National Highway Traffic Safety Administration (NHTSA). The insurance companies back the IIHS; the NHTSA is under the authority of the US Department of Transportation. 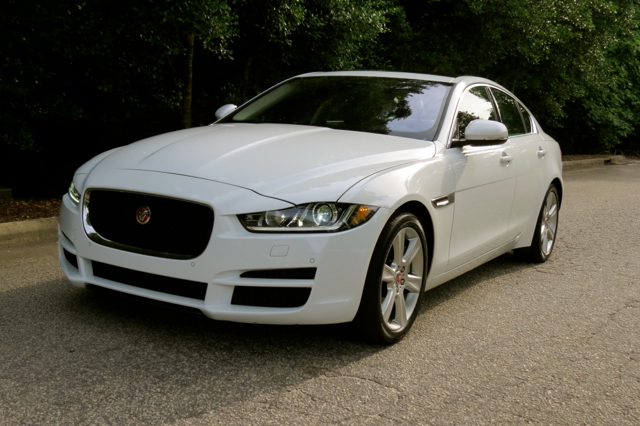 Neither entity, however, has tested the Jaguar XE yet. 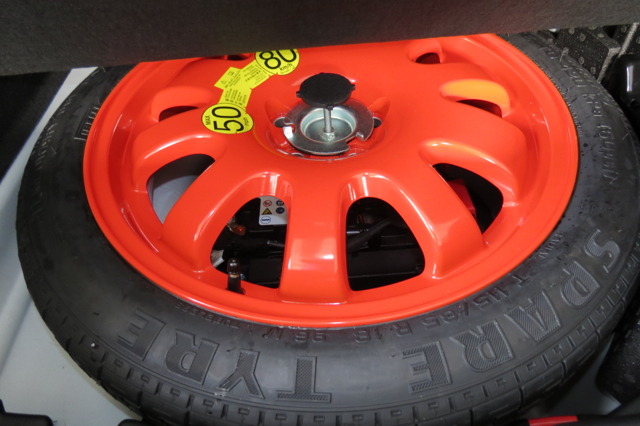 Likely, testing is pending, but absent those results the XE offers maximum protection. To wit, you’ll find “all surface progress control” on every model, technology that operates as low-speed cruise control. Specifically, when traveling at speeds of 2 to 19 mph, the system activates under slippery conditions to control braking and traction. Other safety features available include adaptive cruise control, closing vehicle sensing, blind spot monitoring, semi-automated parallel and perpendicular parking, and reverse traffic detection. 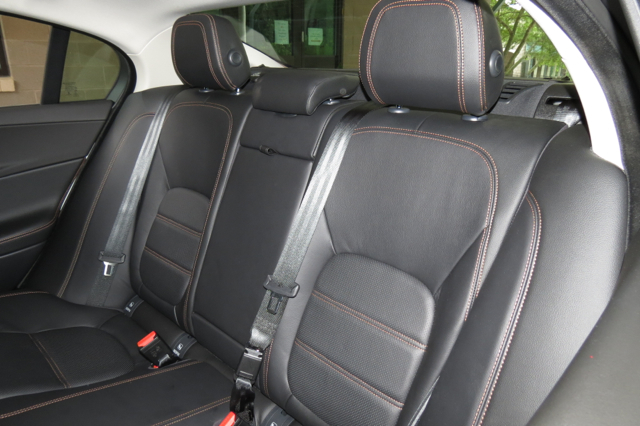 These features are available as you travel further up the trim level grade. Entry-level luxury models typically offer a paucity of upscale features or just enough to set them apart from mainstream models. After all, if you’re paying about $35,000 as your threshold for entry, you can’t expect much. Right? 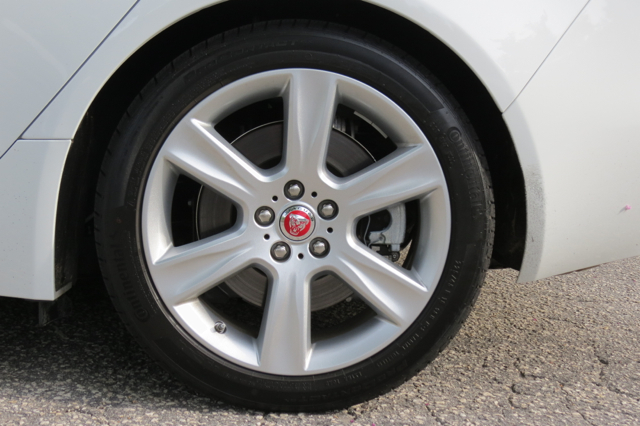 Well, the Jaguar XE provides standard features befitting the brand, including alloy wheels, heated side mirrors, and chrome touches. Inside, you’ll find power front seats, full power accessories, dual-zone climate control, and an overhead console. 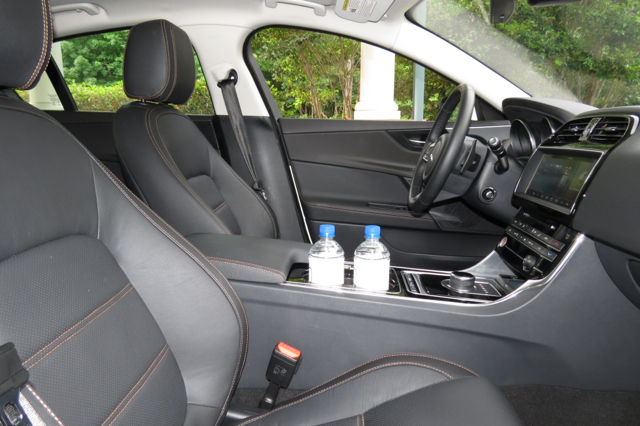 Certainly, soft touch materials are apparent, while you’ll also find a leather-wrapped steering wheel. 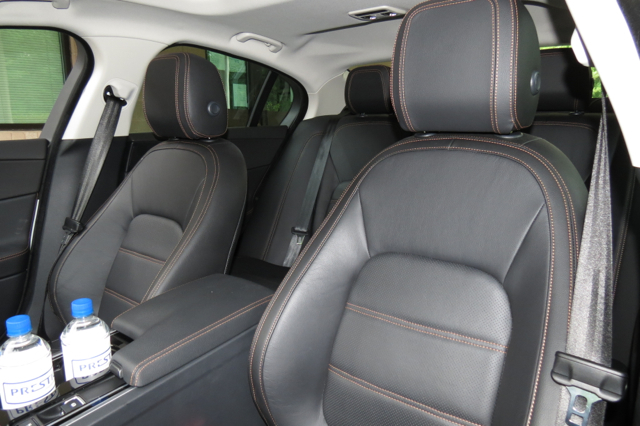 Trim level upgrades pull out all the stops and bring in such features as ambient lighting, a power adjustable steering wheel, heated front seats, front seat lumbar support, an imitation leather-wrapped instrument panel, and upgraded leather. Some models, such as the R-Sport, add exterior upgrades, including a rear spoiler. 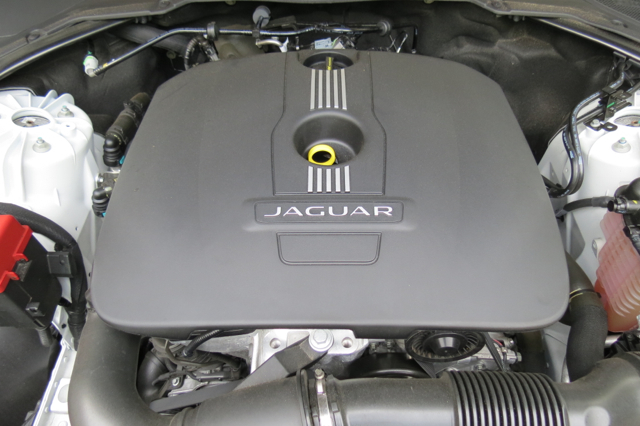 Jaguar packs a lot of power into a small engine. If you prefer gasoline over diesel, the inline four-cylinder engine should be sufficient. Off-the-mark acceleration is steady. Once the turbo kicks in, you’ll enjoy a full burst of power. But prepare yourself for the expected lag — the Jaguar turbo seems slightly slower in spooling up than some competitors. If you’re a fan of Jaguar’s superchargers, you’ll feel the difference immediately. Superchargers deliver full power up front, fading late — turbos kick in later, then deliver full power. The eight-speed automatic matches well with the turbo, shifting seamlessly with no gear hunting detected. Paddle shifters are at the ready for customers who prefer an added measure of control. Unfortunately, there is no manual gearbox to be had. The XE’s strong suit may be how well it behaves on your favorite back roads. Bred for spirited driving, this cat delivers taut steering and responsive handling. Its lightweight frame (3,320 pounds for the test model) frees the body of excess weight that encumbers some models. Further, the standard rear-wheel drive platform should please the typical drive enthusiast. Choose all-wheel drive if you want an extra measure of handling confidence. 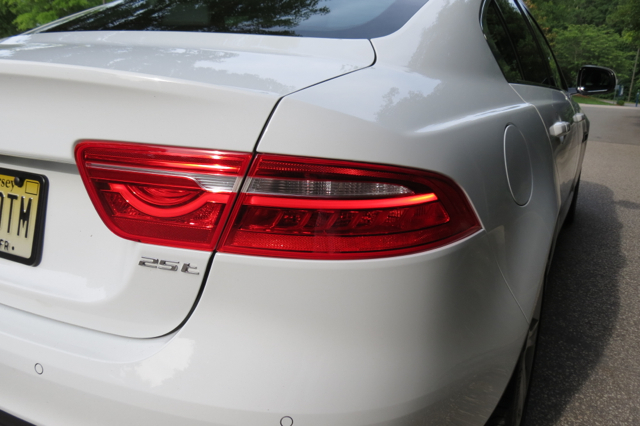 Unchanged are my initial impressions of the Jaguar XE — that second look only confirmed what I had experienced earlier. 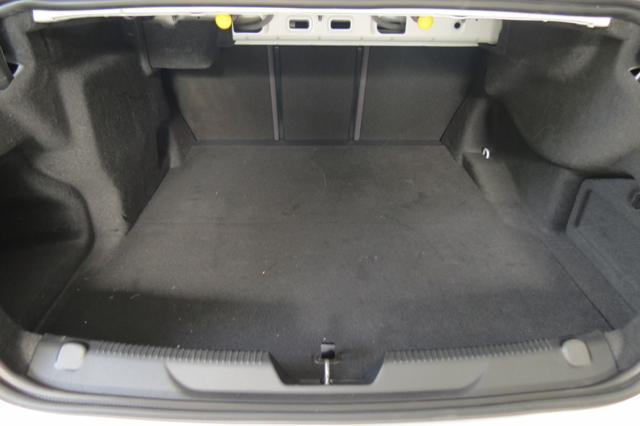 One additional consideration is worth noting: buyers looking for a five-passenger sedan may find the limited rear legroom disappointing. 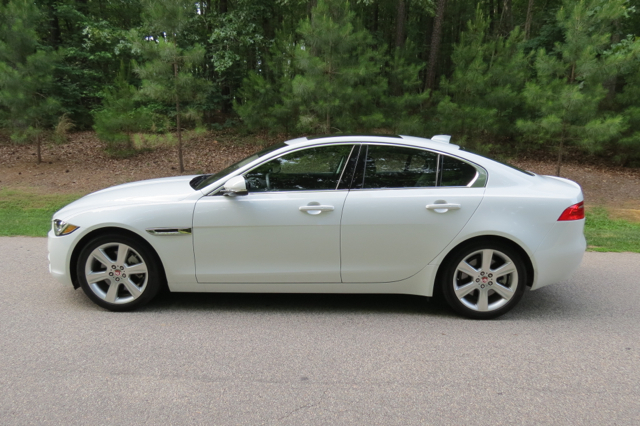 That said, the midsize XF is the better choice here. The XE brings it to the German makes, giving Audi, BMW and Mercedes-Benz much concern in a highly competitive (and shrinking) segment. It outdoes its Japanese competitors, while delivering a strong alternative to the Cadillac ATS. In all, if the Jaguar XE is your entry-level luxury sedan of choice, you’ll have the satisfaction of driving a lithe feline.